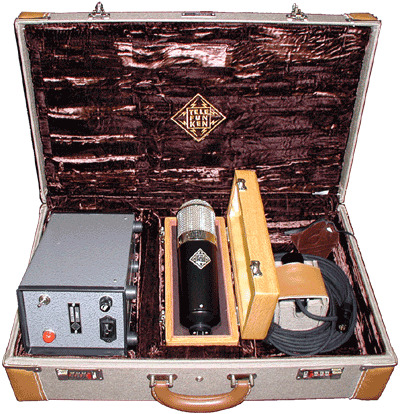 The Telefunken Elektroakustik CineMic is a recreation of a microphone developed in the mid-1950s by Stanley Church for Metro Goldwyn Mayer (MGM). It is a large-diaphragm, transformer-and-tube mic assembled from parts made famous by better-known vintage microphones. The modern recreation of this “Church mic” uses a new M7 capsule “imported from Germany,” from Sigfried Thiersch. The tube is a NOS 6072. Original Church mics used a GE 5-star 6072. Details of the CineMic transformer have not been released. The mic is part of Telefunken’s “Custom Shop,” and is built to order. It ships with a wooden storage box, a vintage-style power supply, a remote pattern switch, and a locking suitcase.